Several prior studies have shown that there are variances among democrats and republicans when it comes to cognitive processes (Lakoff, 2004). Conservatives lean towards structure in their judgments, whereas liberals tend to take more risks (Lakoff, 2004). Interestingly, more recent studies have found this is true not just in voting practices but in everyday situations. Basically we are talking about two different cognitive styles. It’s not surprising then to discover that voters tend to side toward the candidate that fits their cognitive style preference (Bassili, 1995). 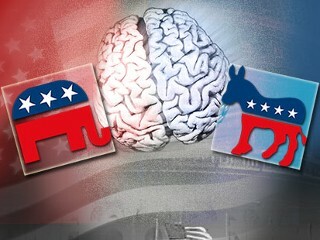 UC Berkeley Institute of Personality Social Researcher found “… individual differences on a conservative-liberal dimension are strongly related to brain activity.” They discovered the area of the brain that deals with conflicts showed more activity in liberals than conservatives (Jost, Krulanski, Glaser & Sulloway, 2003). They reasoned this would make liberals more amenable to acceptance of “new social, scientific or religious ideas” (Jost et al., 2003). So today, when you go to the polls to cast your votes, your choices may be your own, but remember, something else is going on in your brain at that moment when you pull that lever, punch that chad or check that box. Your biological cognitive process may be leading your decision and your vote! Hope to see you at the polls! Bassili, J. N. (1995). On the psychological reality of party identification: Evidence from the accessibility of voting intentions and partisan feelings. Political Behavior, 17, 339-58.